TSR: "I believe there is still one last chance..."
WOLF BLITZER: Secret talks with Iraq's insurgents -- there are new details emerging on contacts with the enemy from America's outgoing ambassador. Zalmay Khalilzad says the aim is to try to persuade those insurgents not to side with al Qaeda. 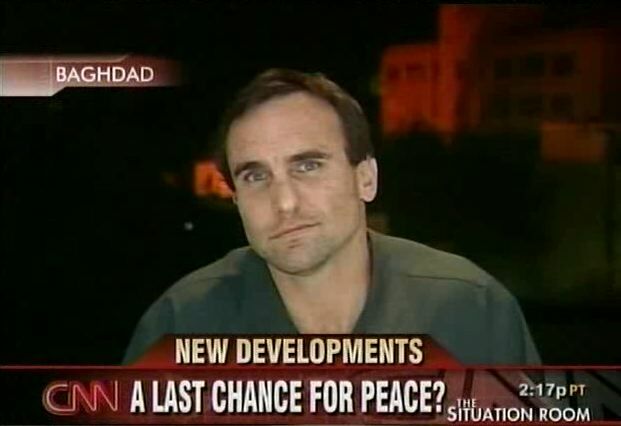 Joining us now in Baghdad, our correspondent Michael Ware -- Michael, did the U.S. miss any opportunities in trying to deal with these Sunni insurgents? MICHAEL WARE, CNN CORRESPONDENT: Oh, absolutely. Almost from day one. And that's been repeatedly admitted, certainly privately, by U.S. military intelligence officials, by officials from U.S. intelligence agencies and by certain diplomats. I mean, I personally sat with Baathist, Sunni, nationalist insurgents -- Iraq's version of former West Pointers, Iraq's version of ex-members of the CIA. From the very beginning, from the fall of Saddam, they had no love lost for that dictator. But they loved their country. They saw themselves defending it. What they couldn't understand is why America was attacking it, why America was occupying it. From the very beginning they said we have more in common than we have in difference. They're prepared to host U.S. bases. They're prepared to deny sanctuary to al Qaeda. They're prepared to oppose Iran. Their big problem has been this government, that they see that the U.S. has brought to power, a group of exiles who left the country during Saddam and took sanctuary amongst neighboring Iran, principally. So that's where the difference lies. It all comes back to the old Iran-Iraq, Iran-U.S. differences and rivalries -- Wolf. BLITZER: You know, there are moderate Sunnis, there are moderate Shia, certainly plenty of moderate Kurds. But the question is this, Michael, among the more militant Sunnis, the Sunni insurgents, the more militant Shiites, the militias, can their divisions ever be brought together? Can they ever make peace given the hatred between the militants on both sides? WARE: Well, this is the question -- has the civil war gone so far already that the scarring on the national psyche is so deep that no one can ever recover? Certainly there are extremists on both sides for whom there is now and never shall be room for negotiation. What's at stake is the middle ground, middle Iraq. And I have to tell you, be they former Baathists who believe that they fought for their country; be they Shia militia who they believe have opposed a foreign occupier, not in the name of Islam, not in the name of Tehran, but in the name of their country; among these people, I believe there is still one last chance to bring them in under a nationalist umbrella. And it's up to America now whether it can harness this kind of Iraqi pride.